Four years ago, I sent in my first PIT application to work in the Fishlake NF in Utah, building hiking and backcountry horse trails. The description of the work in the PIT Traveler sounded challenging. Indeed, Bob Leonard, the Fishlake FSarchaeologist in charge of the PIT projects in Bullion Canyon, enjoys telling people how he hesitated when accepting my application, because he envisioned having to babysit a middle-aged, probably gone-to-seed, hinky-dink librarian. Now he refers to me as his “master hard-rock driller.” If at any time in the future I consider chucking my career as a librarian for jackhammer work, he said he’d be happy to write a letter of reference for me. I doubt I’d do it, but it’s comforting to know I have acquired another marketable skill! In past years on this project, I have drilled dynamite holes on a stretch of rock on the trail above a 60-foot waterfall that I have affectionately dubbed “Alcatraz.” My first year’s work along that 50-foot section of trail was wiped out the following year by a raging flash flood that crashed down the gully. This stretch of trail was in a very steep, rugged gully, and access to the high country would be seriously impaired unless the trail could be repaired. Plans were made to drill holes for a lacework of thick-gauge rebar to support a trail base of rubble. I couldn’t not put in for a second year on my little Alcatraz, because wasn’t I the master driller? Although I’ve made it sound like penal punishment, the hard work was shared and lightened by the company of other interesting and hard-working volunteers who were drawn from places around the state and country. It was a satisfying moment when the last rebar was set in place and the rubble trail base was anchored. I returned for a third year with one of my sons, Will, when the chance to work and camp for a week in the highest reaches of this “Sound of Music” paradise (I can’t think of any more beautiful stretch of mountains in this mountainous state) beckoned. 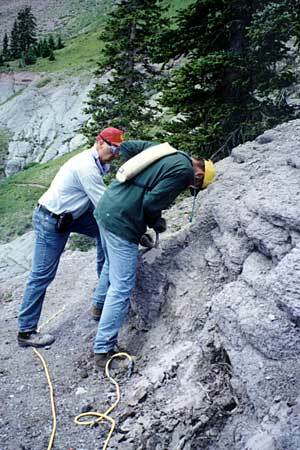 One aspect of the project called for more rock drilling (my specialty) on some slick outcroppings that had proven hazardous to horse riders. A small but enthusiastic crew of excited volunteers assembled, including one (Mike) who had flown in from New Jersey. (Was he ever sucking wind the first day!) 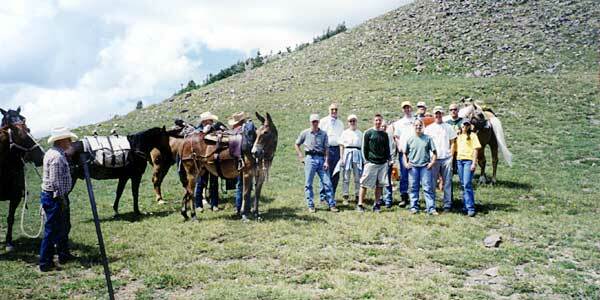 A backcountry horse riders organization volunteered to pack in all our gear to the base camp. A helicopter hauled the heavy drilling gear, generator, water, and miscellaneous supplies and set them down in camp. It was like a small military operation. Then it was off to Hoover’s for burgers. It’s a toss-up as to what keeps bringing us back—the greasy burgers at Hoover’s across from Big Rock Candy Mountain or the beautiful Tusher Mountains of central Utah. Allen White (whose business card reads “Retired & Moving On”) claims that he drove out from Oklahoma for two years straight to work on the Bullion Canyon trails because of the burgers. I do like the burgers, but a chance to spend a week in Bullion Pasture or the Pocket is a compelling drawing card.